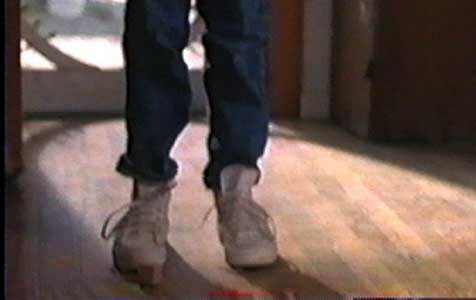 Max Pomeranc wears optical white high top Converse “Chuck Taylor” All Stars in the film. Journey walks around the farm aimlessly after his mother leaves him. Journey is a film not about a trek somewhere, but about an eleven-year-old boy named Journey (Max Pomeranc) who faces an uncertain family future. 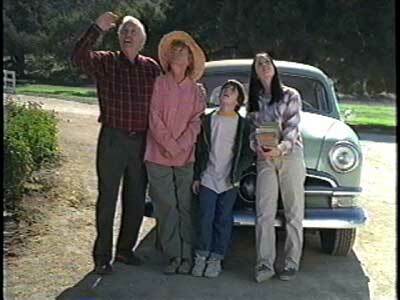 As the film opens, we discover that Journey is living on the family farm with his grandparents Marcus (Jason Robards) and Lottie (Brenda Fricker), his sister Cat (Eliza Dushku), and mother Min (Meg Tilly). While his grandparents have had a stable life and marriage, Journey’s father deserted Min and the kids many years ago, and now Min has no desire to live with her family any more. Constantly arguing with Marcus about how to live, one day Min decides to leave the family. After a final argument with Marcus, Min packs her suitcase and prepares to leave. Journey is very upset by this, hanging onto her and the door of her car as she is about to drive off. The two children react differently to Min’s departure. Cat expresses anger at Min by getting rid of the few possessions she left behind, but focuses her energy on helping Lottie with the family garden. Journey internalizes his confusion and emptiness, expressing anger at Marcus for saying that Min will never return, keeping one of Min’s sweatshirts under his bed, asserting that the family will soon be back together, and that Min will be in touch when she gets settled. The most upsetting thing to Lottie and Marcus is when they discover that a box of family photos, all that they have to remember the family, has been ripped up by Min in a fit of anger and frustration. Among the possessions that Min has left behind is a camera. Neither Cat nor Journey are interested in the camera, but Marcus takes it and starts beginining to shoot photographs around the house and farm. “Why do you do that?” asks Journey, but he soon begins to learn why, as he and Lottie go through an old family album. Journey and his grandmother look at one of the family photo albums. When their cousin Cooper comes over to visit, he mentions how much the family looks alike as he peruses the photo album. When Marcus comes in and begins to play with Cooper’s baby brother Emmitt, Journey grabs the camera and instinctively takes a photo. Marcus tells him that he did a good thing, and that he should feel free to take as many pictures as he wants. Later Journey asks Marcus why people take pictures, because they are not real. Marcus replies that people take pictures so that “they can see what is there. Look at the pictures to see what I mean.” Meanwhile, Min does try to telephone occasionally although she usually she hangs up when anyone but the kids answer, and sends envelopes with money to Journey but with no return address. She seems content to aimlessly drift from one waitressing job to another. Marcus and Journey get more involved in photography as the story continues. Things come to a crisis point when Journey demands to see the photos from his early days, so that he can remember his father and mother, and Marcus reveals to him that Min tore them up. This sends Journey into a depression and anger at Marcus for telling him the truth, but ultimately leads to a greater understanding of his life and family. The story line of Journey continues in this manner as young Journey gradually begins to comprehend one of the most important things in life: his family identity and traits are always with him — even with the absence of his mother. Cat looks at the photo album while Journey lounges on his bed. Journey was produced as part of the Hallmark Hall of Fame series of television specials. The film was produced by Glenn Close and Richard Welch and adapted for the screen by Patricia MacLachlan from her novel. As usual, the production is of high quality, well cast, with great cinemaphotography and outstanding acting work by Jason Robards and Max Pomeranc. Robards gives another great performance as the crotchety grandfather with a heart of gold, helping his grandson learn how to cope with life’s ups and downs. Pomeranc gives a sensitive performance as Journey, projecting both the vulnerability and inquisitiveness of an eleven-year-old trying to cope with the loss of his mother. The female cast members are also effective, with Brenda Fricker as the laconic grandmother, Lottie, Meg Tilly (sister of Jennifer Tilly) as the restless Min, and Eliza Dushku, as the older sister mature beyond her years. The film progesses at a leisurely pace, with much time for reflection, which is part of its charm. It reveals that a good life can be based on a simple existence, and continually uses references to photography and family pictures to remind you about what is important in life. A plane flying overhead distracts Marcus and the family during a photo shoot. Journey discovers the box of torn photographs left by Min while searching for his cat Bloom. 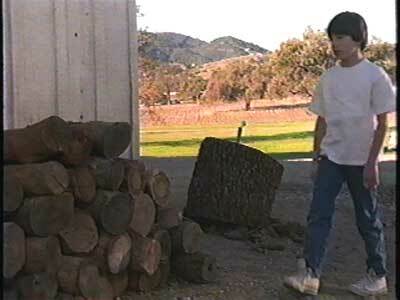 Max Pomeranc, in his role as Journey, wears white high top chucks during most of the film. The best chucks scene is when he is shown in his room looking for his cat Bloom and finds the box of torn-up photos. Journey carries Bloom while his sister Cat watches; the camera focuses on Journey’s chucks for a moment. Journey. (1996) Jason Robards, Brenda Fricker, Meg Tilly, Max Pomeranc, Eliza Dushku. Directed by Tom McLaughlin. Categories: Drama, Coming of Age, Family.